For Aric’s birthday, two weeks ago, I decided to surprise him with a birthday cake made by myself instead of buying one. 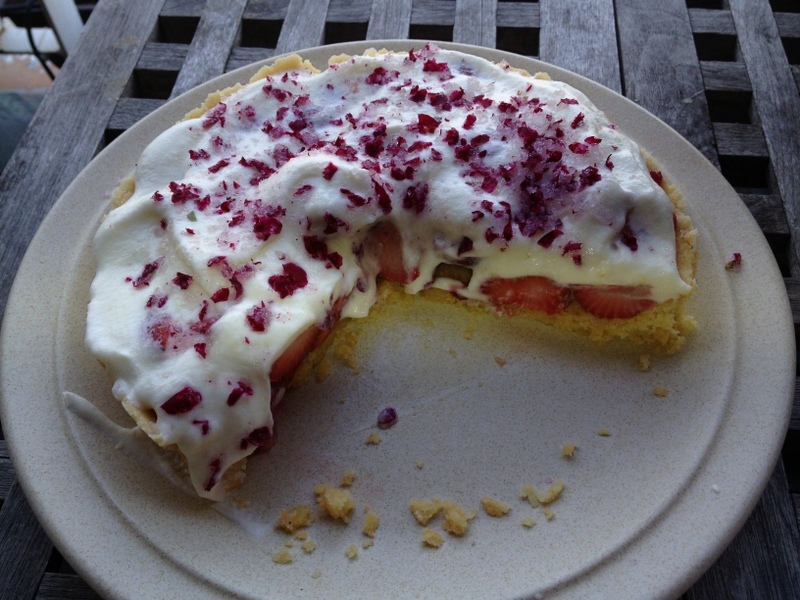 A simple one, with his favourite strawberries and lots of cream. Note the subtle detail of crushed rose petals for decoration! A few days later I had a routine check with my urologist. 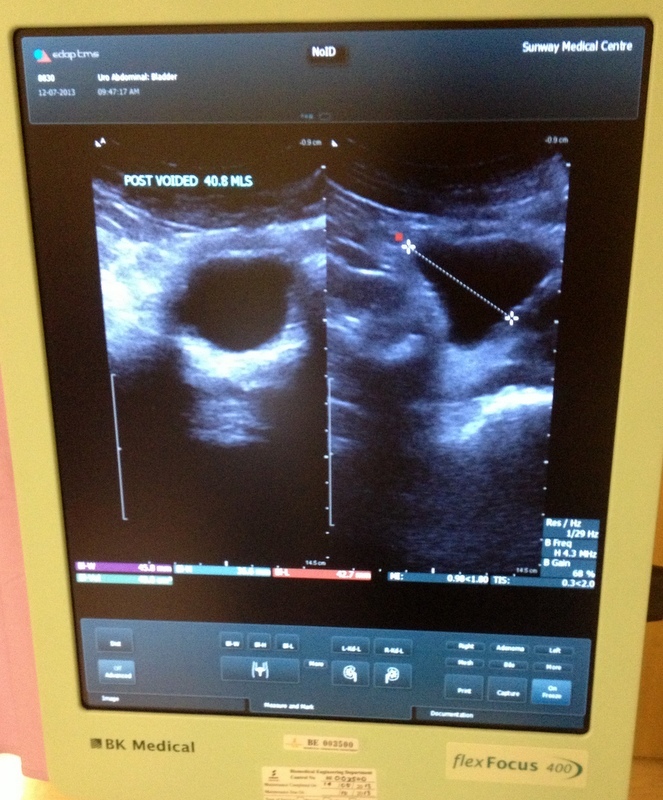 Everything was ok for a man of my age…:-) Somewhat shy I show you here a ultrasound scan of my interior, don’t ask me what it all means. After a few weeks rest to let my knee heal, I am walking again in Kiara. 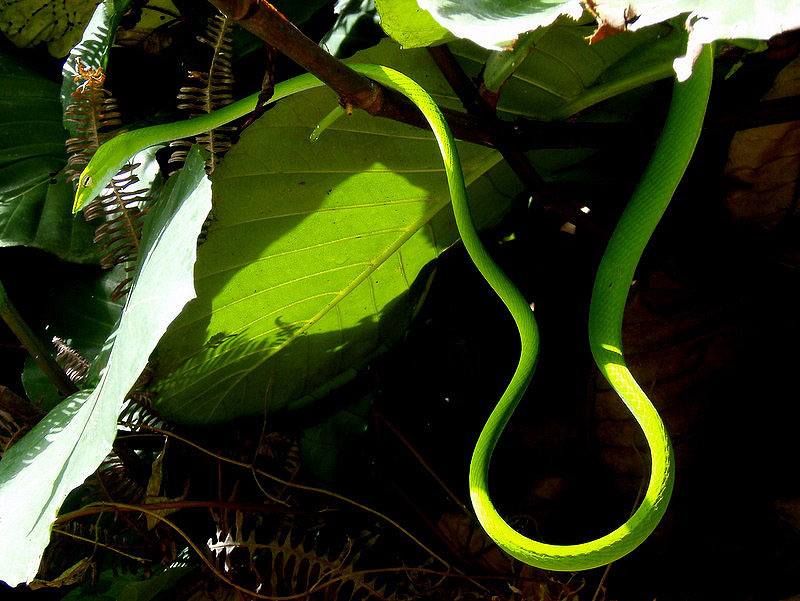 Here two “green” pictures, a beautiful (harmless) tree snake and nice green flowers, name unknown. 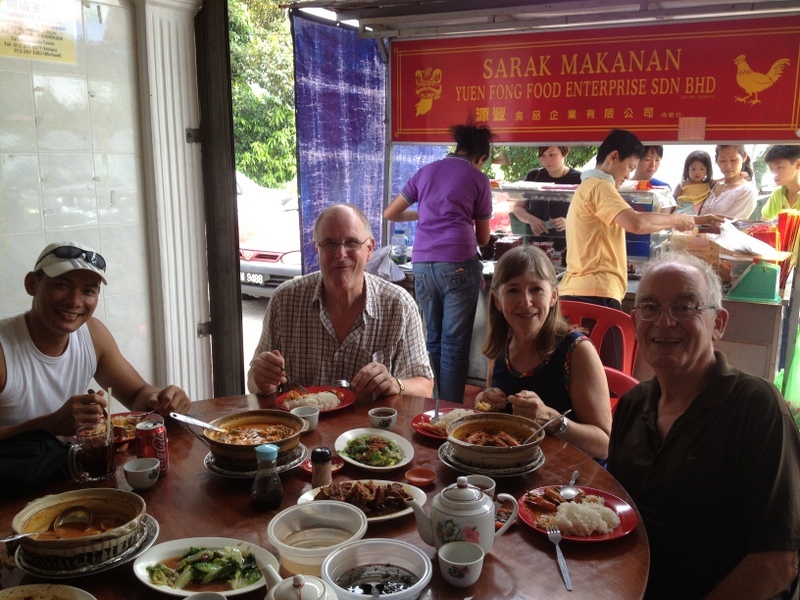 We are just back from a few days in Sabak Bernam, Aric’s hometown. His mother had been staying with his sister for a while, and we brought her home. 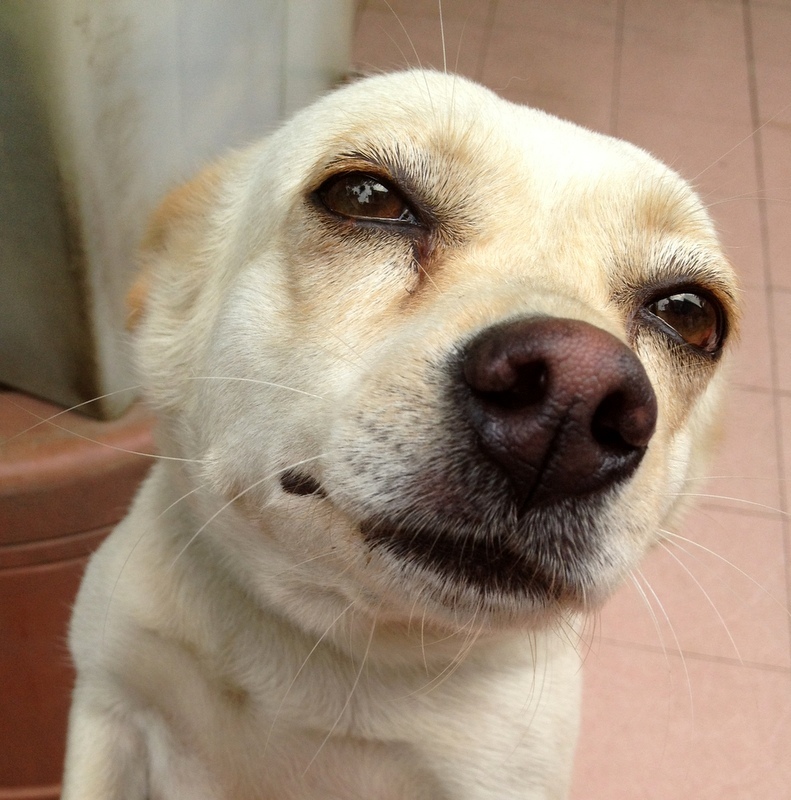 I am more a cat person than a dog lover, but the cute dog in the sisters house was so adorable that I had to take a picture. 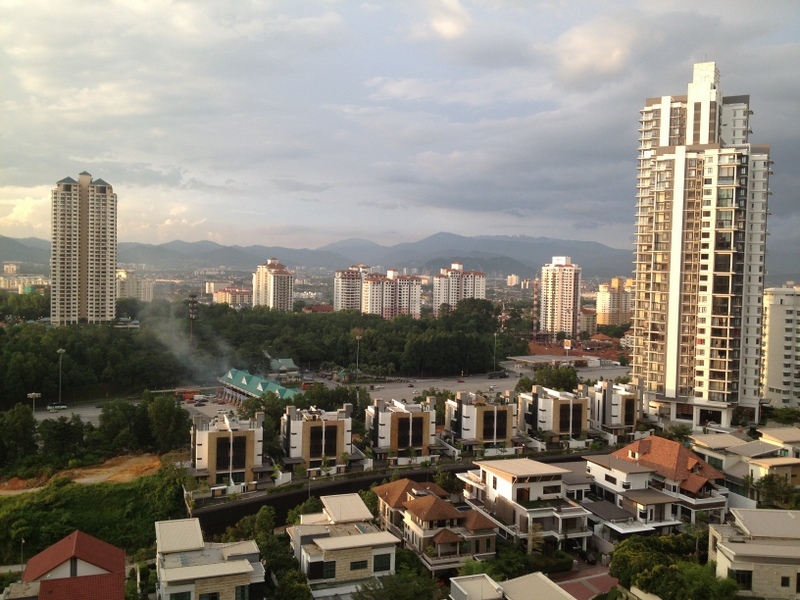 The haze had come back, so we cancelled our planned visit of Bukit Melawati. 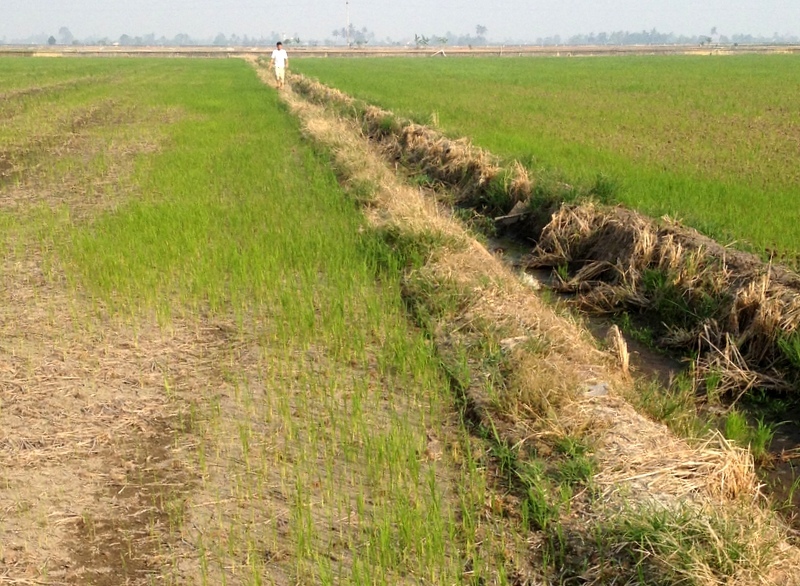 Instead we drove through the paddy fields, which did not look very healthy, not enough rain? 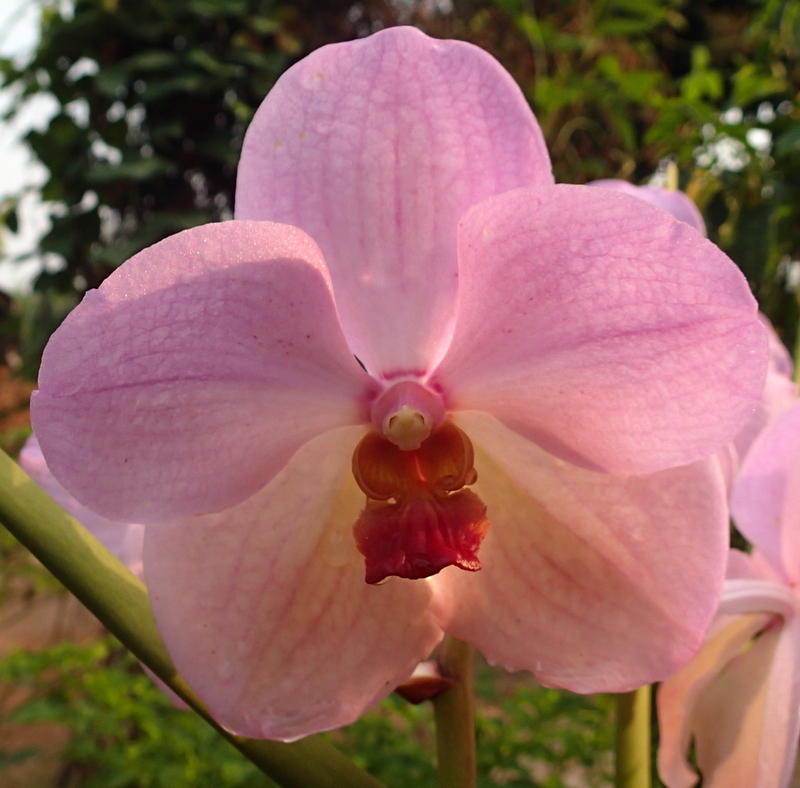 We visited a famous temple near Sekinchan, surrounded by paddy fields, see separate post. 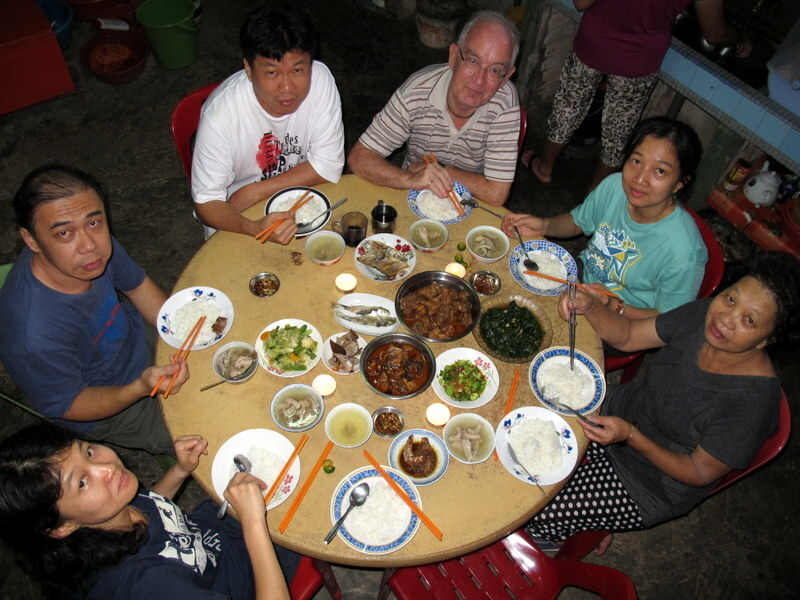 And we had dinner in Sg Besar in a restaurant famous for its chicken feet, prepared in a special way, really delicious. 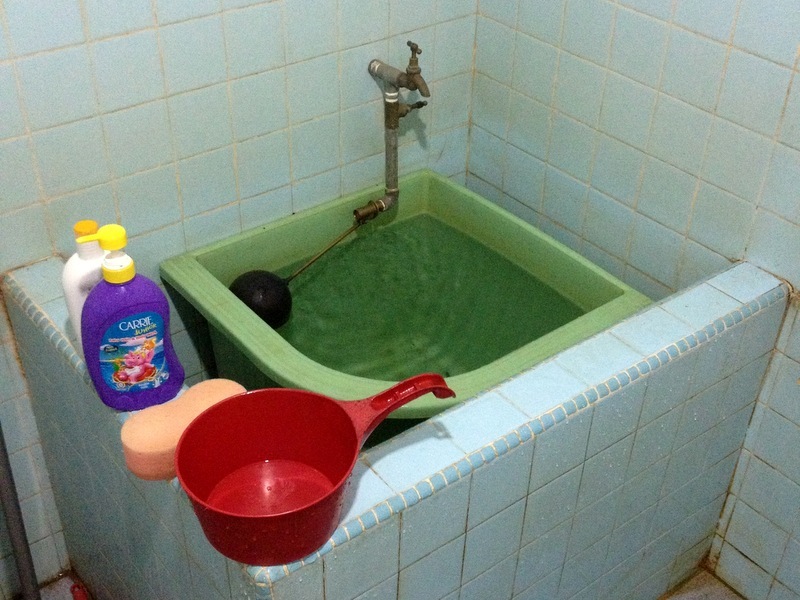 In Aric’s family house you still take a bath in the traditional way, refreshing but quite cold in the morning. 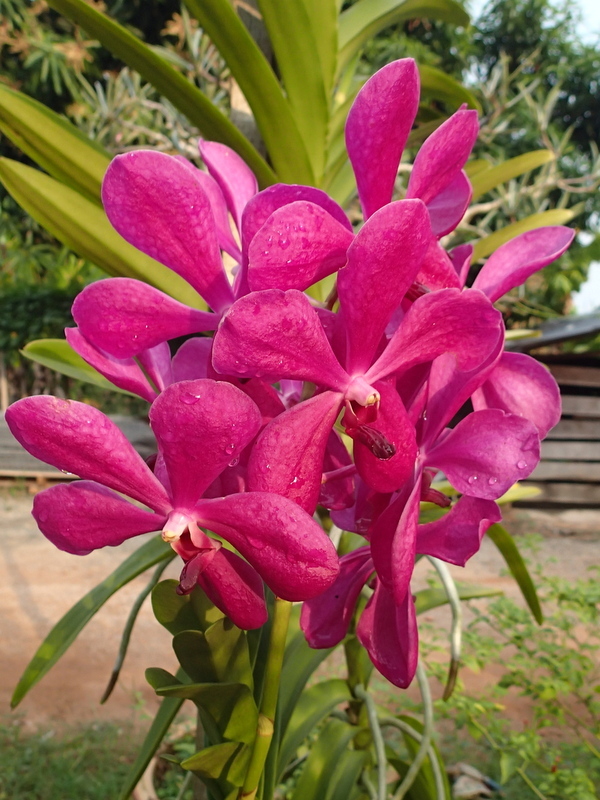 So you are really awake after your “mandi” and in the mood to enjoy the beautiful orchids in the garden. There was a celebration in a nearby temple, with Chinese opera, and offerings by the villagers. See separate post . 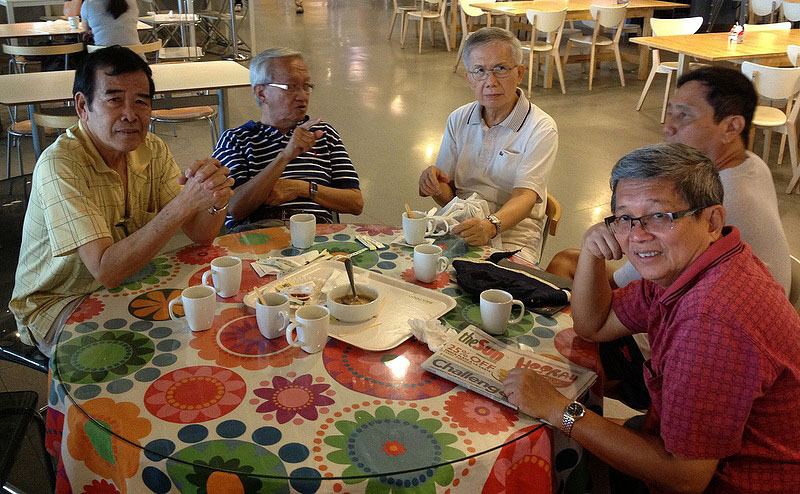 About five years ago, I have made two trips with my Kiara (walking) and Gang of Four (birding) friends. Searching my archive for something else, I came across the pictures taken during these trips. The first one was on 8-5-2008. 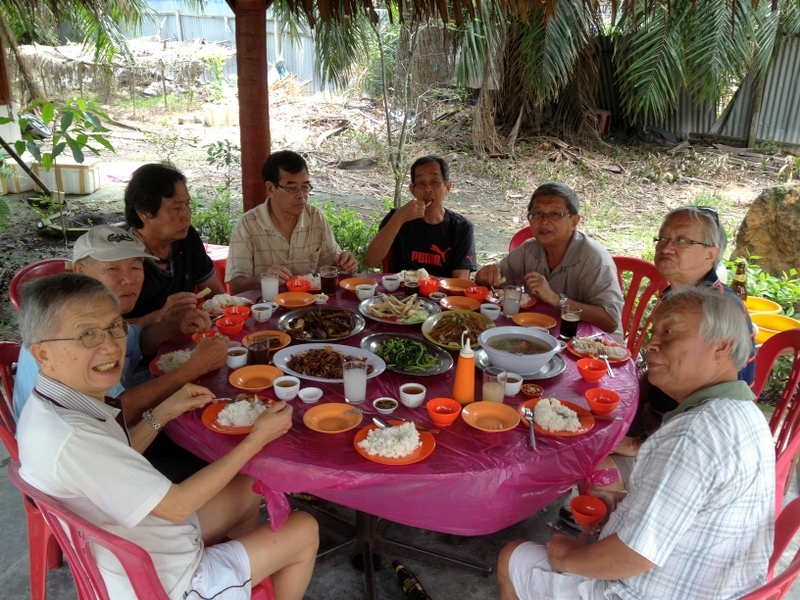 A few months earlier I had discovered a nice restaurant in Ulu Yam, so I wanted to bring my friends there and offer them lunch. A Dutch treat, so to speak..:-). 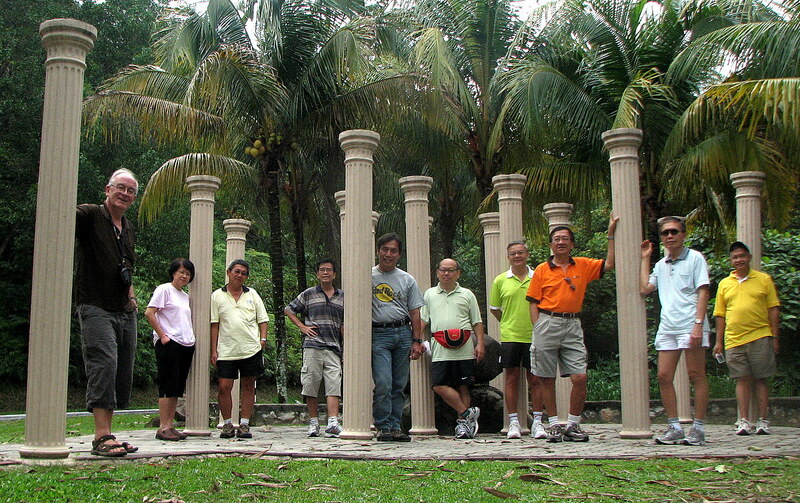 The route to Ulu Yam passes the Batu reservoir, where we took a picture of the group. Here are some pictures of the trip. 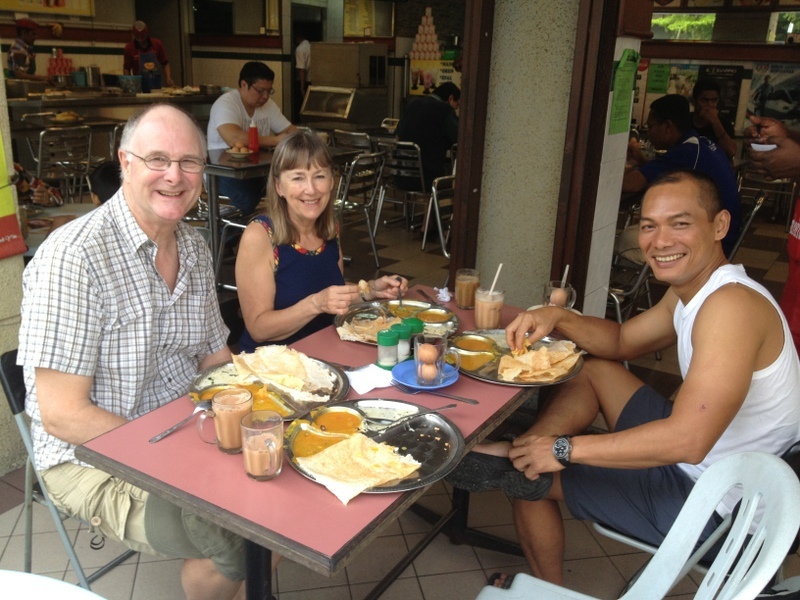 We stopped for a while at the Sg Tua waterfall and then continued to the WK restaurant. Their menu is limited but the quality is good and it is VFM (Value For Money). After the lunch we visited the Buddhist Monastery and Temple near Ulu Yam. It is the Sakya school of (Tibetan) Buddhism that is followed here. 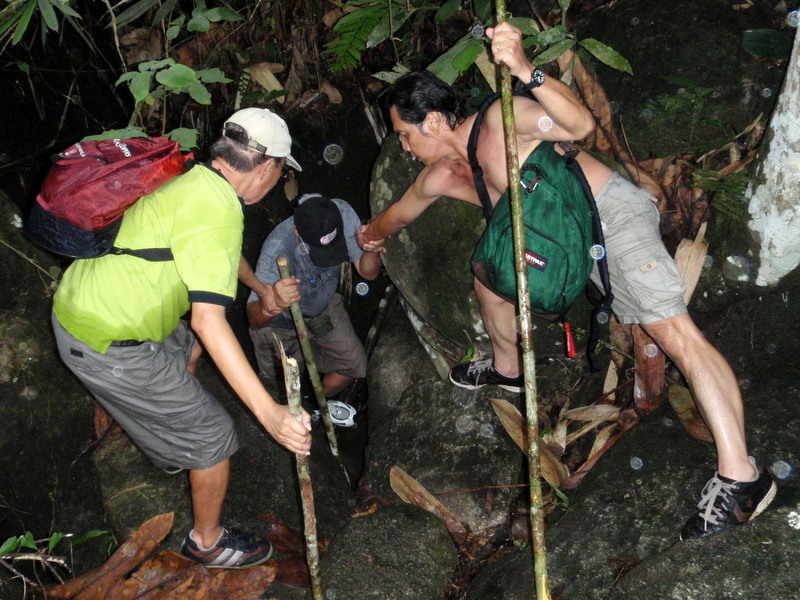 Because of the high water level, crossing was not that easy, but helping each other we managed. Just before you reach the fall, some scrambling is needed. Also here our fellowship made it easy. 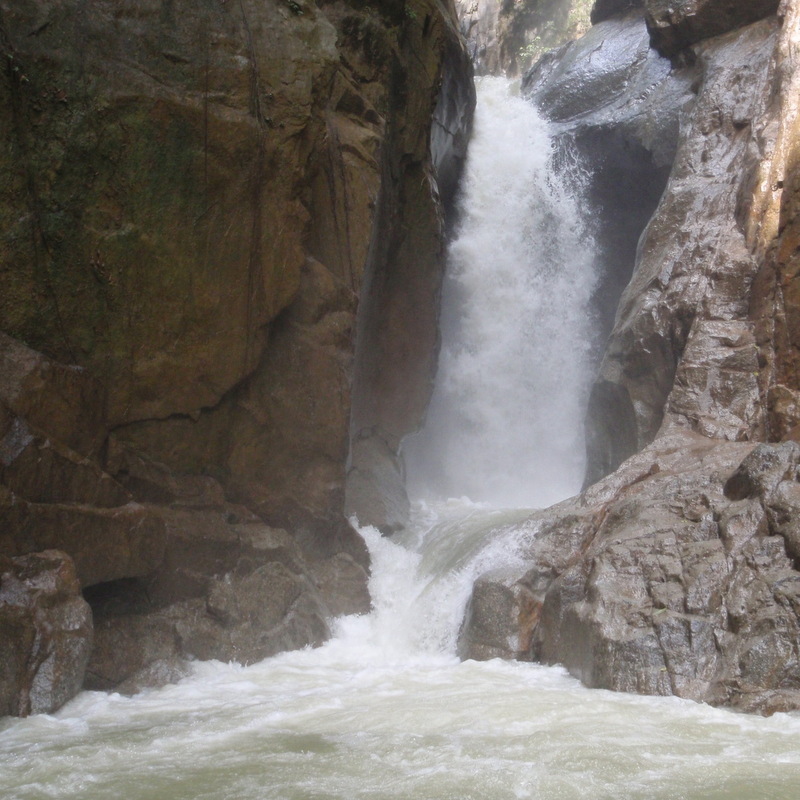 This is the impressive Chiling waterfall. More pictures in the gallery below. 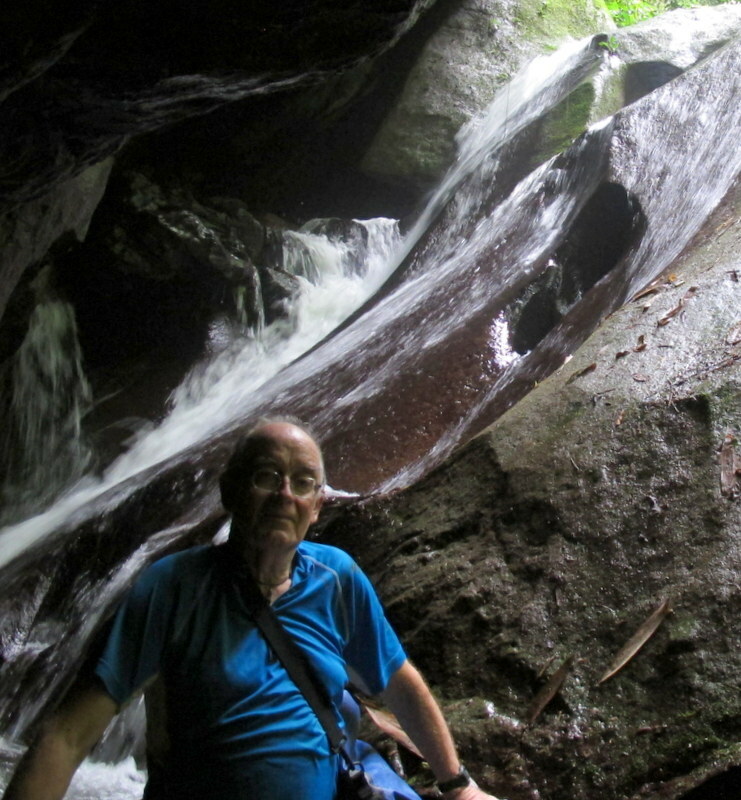 Our group was a mixed one, a few birders stayed behind and took pictures, the others followed me to the waterfall. We had big fun at the fall, before we walked back. Lunch was again at the WK restaurant. Here are two videos. 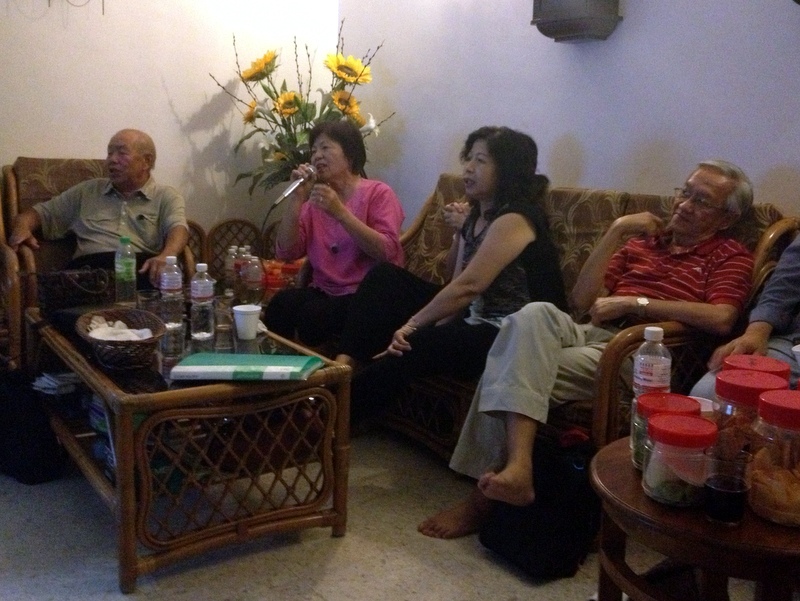 Quality is not very good, but you can feel the fellowship and the fun we had. Sudah Makan? 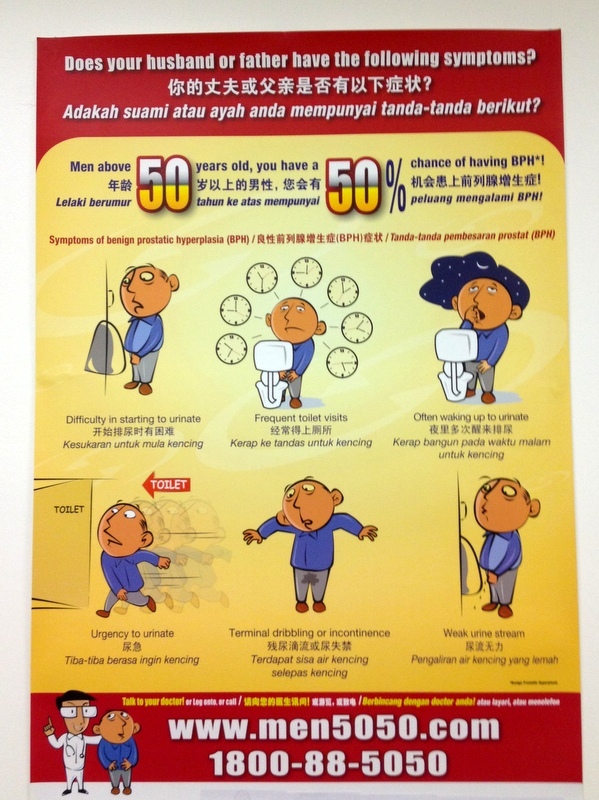 (Have you eaten already) is a customary greeting in Malaysia, where you would say in English: How Are You? 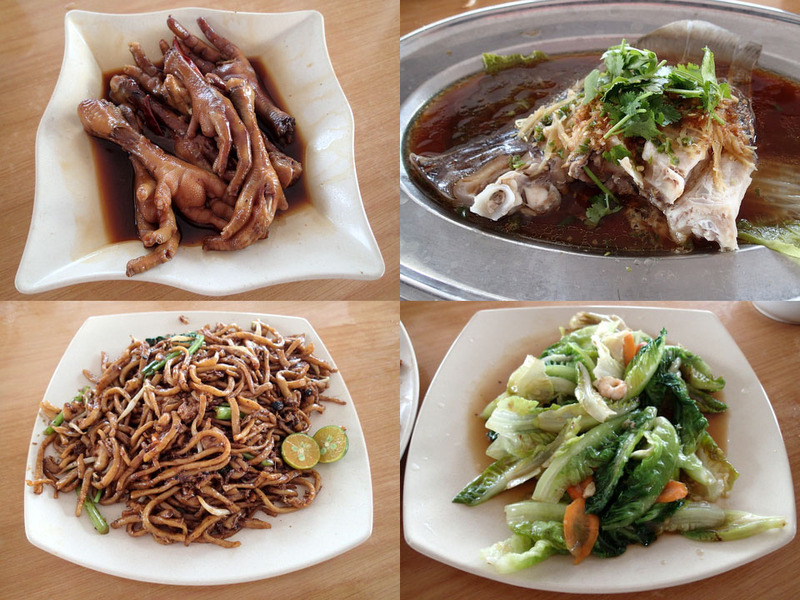 Lunch with my Kiara gang, Telok Gong restaurant. Nice food, and toddy, my favourite drink! 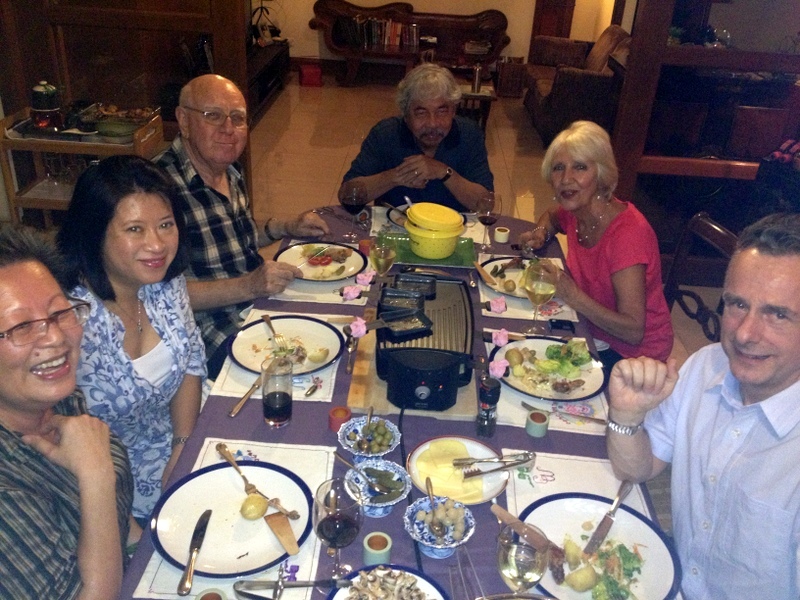 Raclette dinner with Pat and Wim, and their friends. Nice view from their condo, delicious food and pleasant company, what more is there to wish? 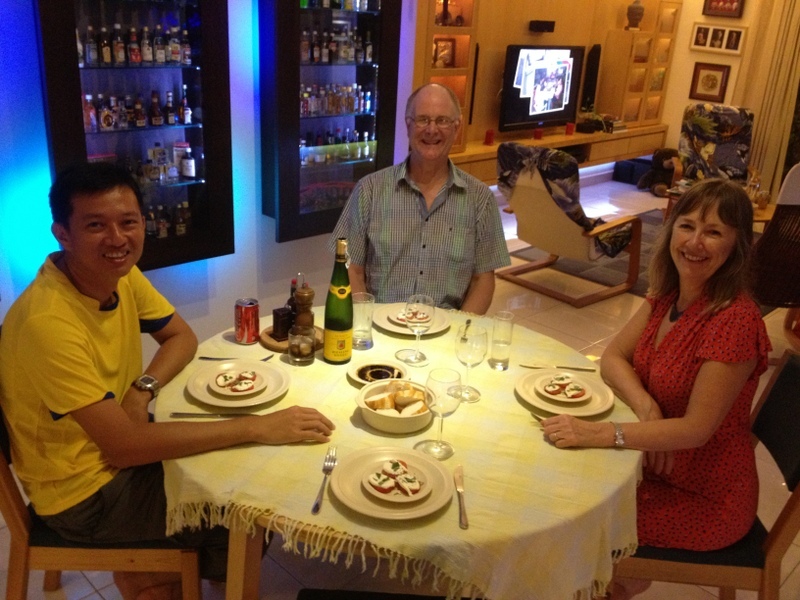 Dinner with Cathy and Neil at our place. 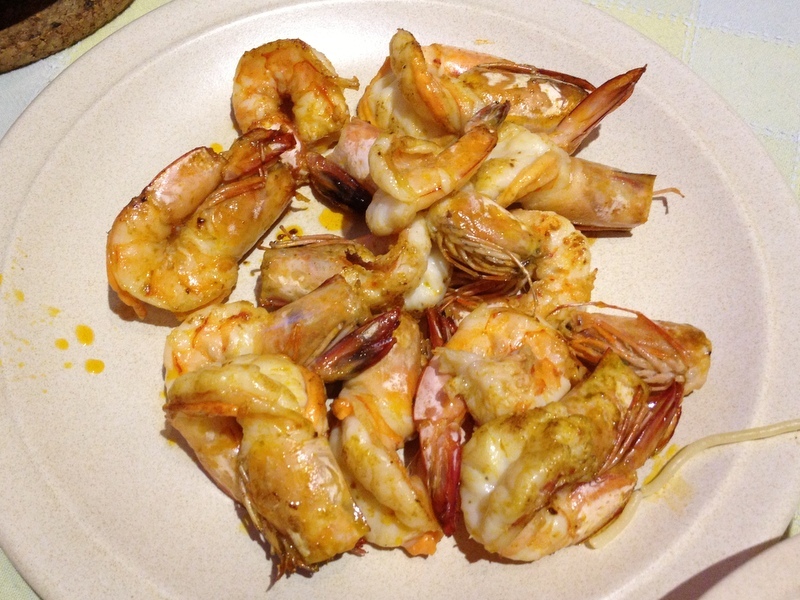 Italian cuisine with an Asian touch. So, yes, Sudah Makan! And the good news is: slowly (0k, very slowly…) I am loosing weight! Let me start this journal with Bukit Lanjan. 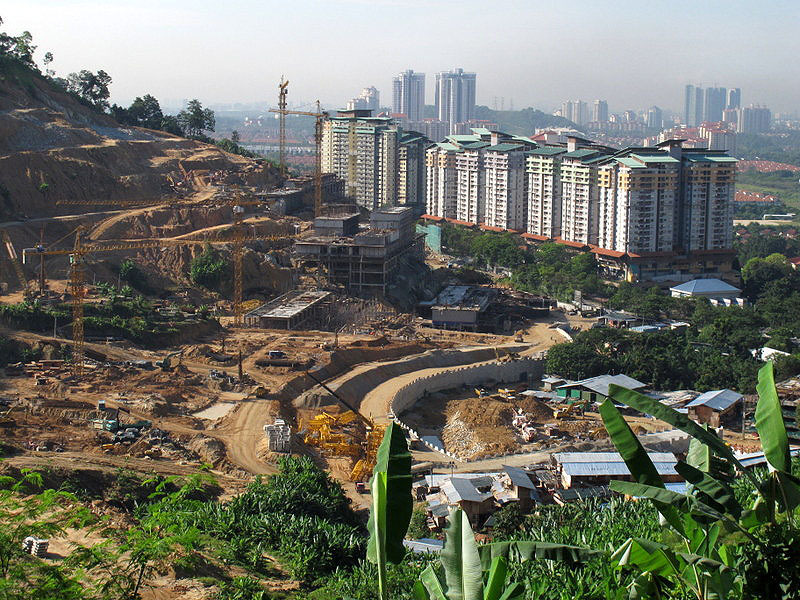 The construction/destruction of what once was a beautiful forested slope opposite our condominium, continues. Here is a view of the slope. 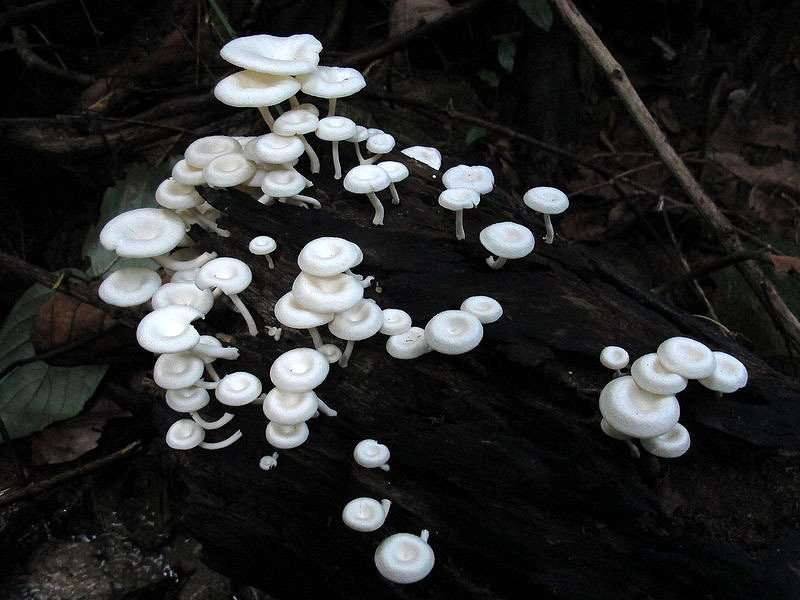 Next to the ugliness a picture of beautiful fungus found along one of the few remaining trails. 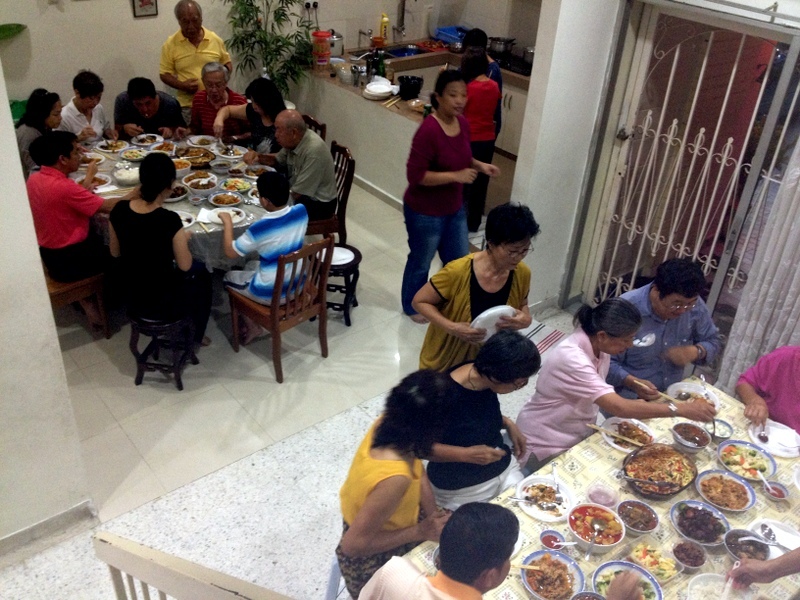 I celebrated CNY with Aric’s family in Parit Baru. It was a nice family reunion, although of course the absence of Aric’s father was felt by all. . Here are a few pictures I took during my stay. 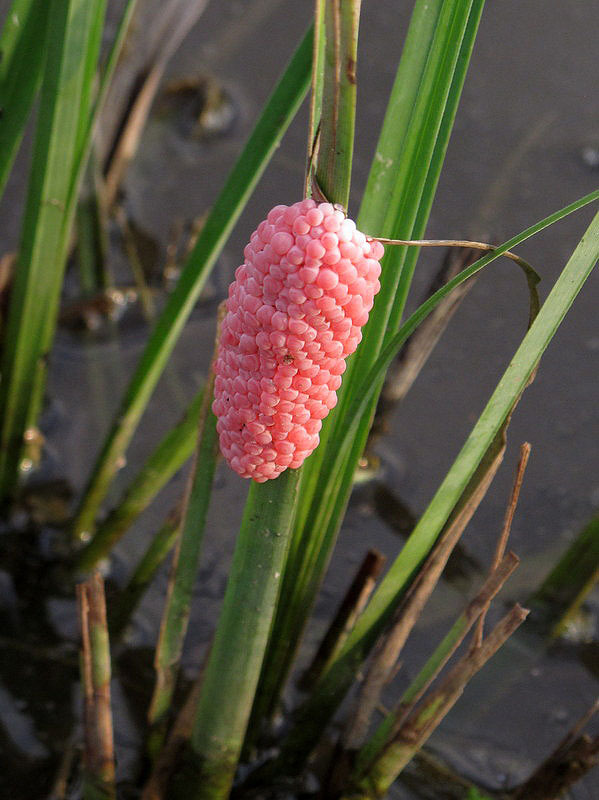 You may wonder what the pinkish “caviar” in the left picture is…:-) They are snail eggs! 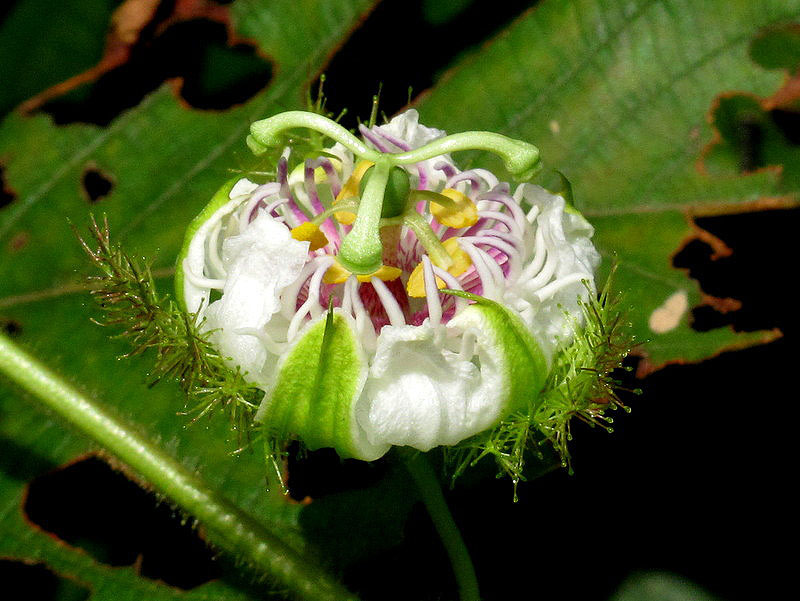 The flower in the middle picture is a kind of passion fruit flower. And in the right picture a couple of sun birds is building their nest in a tree just in front of the family house. It is less flimsy than it looks. 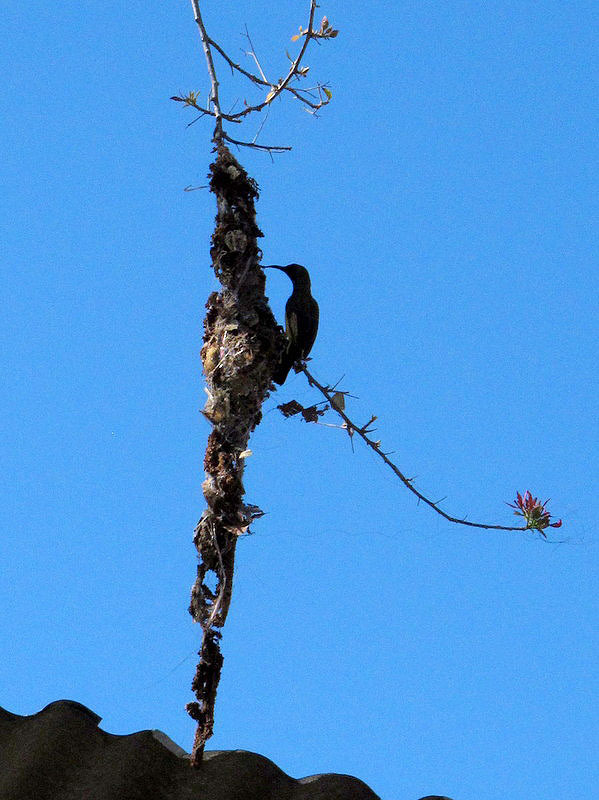 Click here for a YouTube clip of the nest building activity. 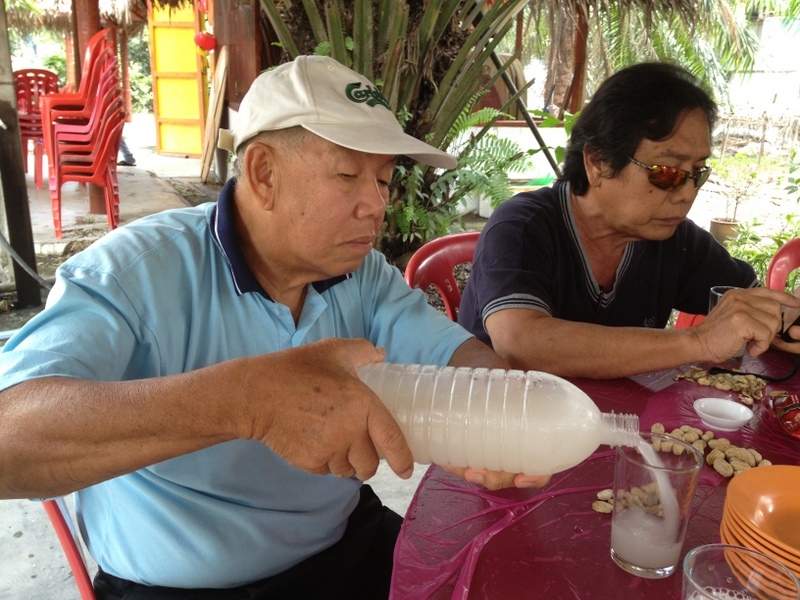 On the third day of the CNY I drove to Teluk Intan, where I met Siang Hui for a waterfall trip. 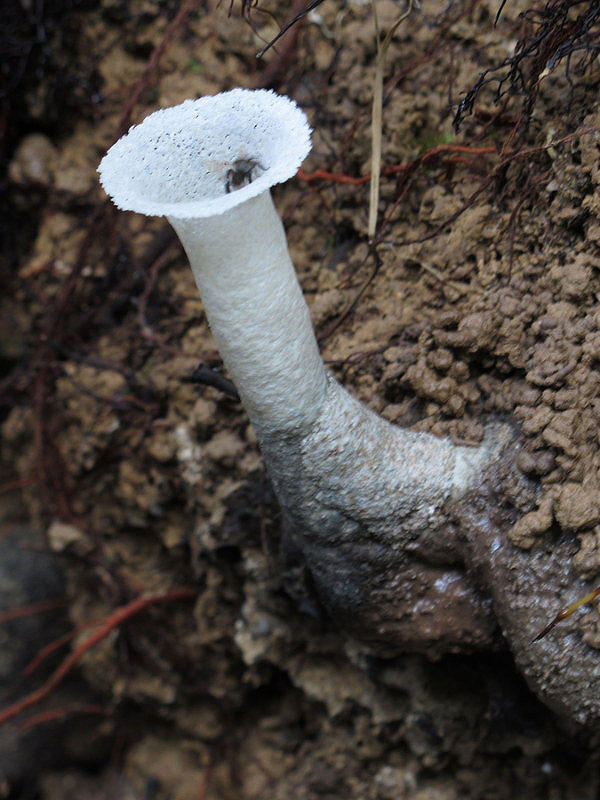 See the separate Ulu Licin blog. 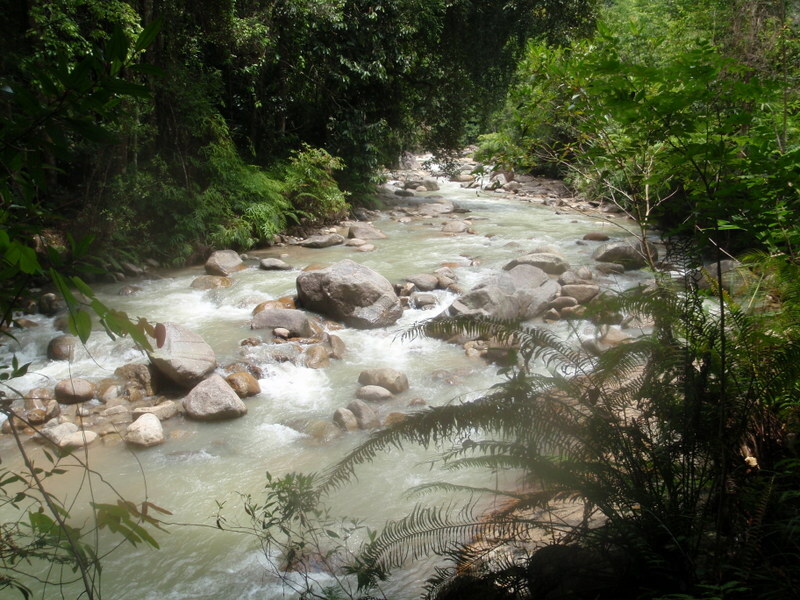 The next day I visited the Nyangung waterfall. 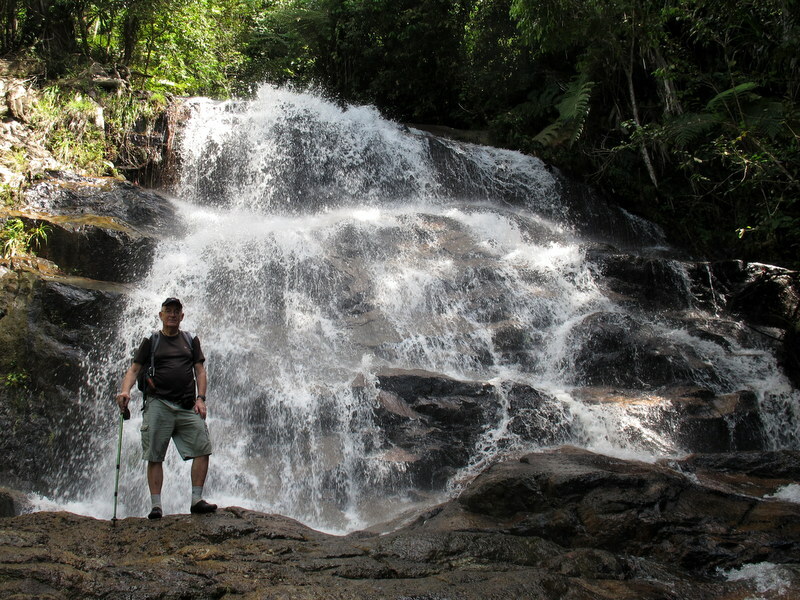 Also a separate blog, Waterfall Adventure. During our scramble down the slope to the waterfall I noticed the beautiful “tube” in the right picture. It’s not a fungus but the nest of a colony of wasps/bees. Because of my allergy, I kept my distance, but had to take a picture. So beautiful. 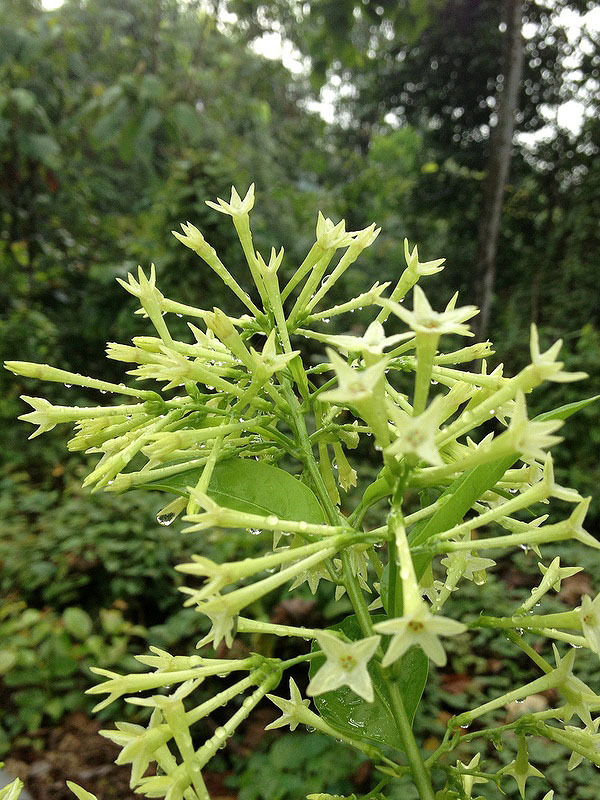 I will end this blog with another hill, Bukit Kiara, where I have my regular morning walk. 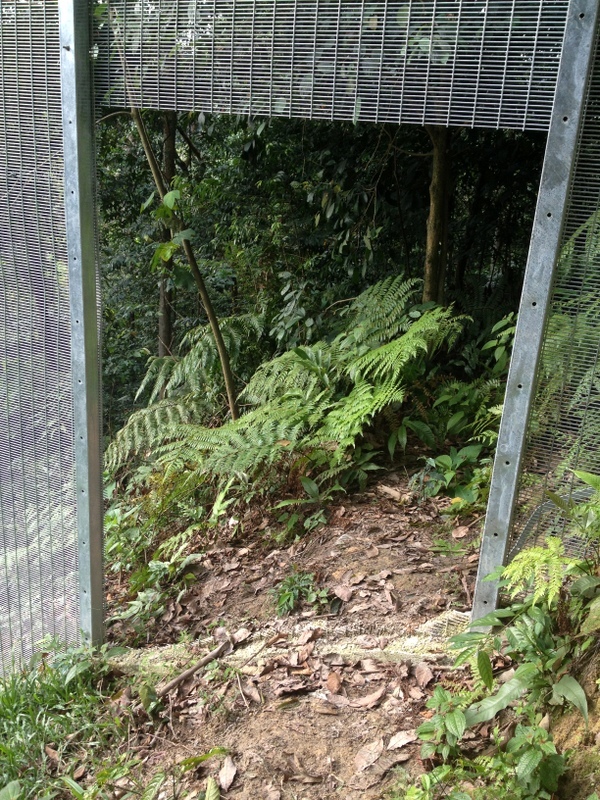 Also under threat, see my earlier posts about the infamous fence. During a walk with my friend Pola, we came across this recently made (illegal) opening in the fence. Strange that the person(s) who did this, kept the upper part intact. The right pic shows part of the foundation. 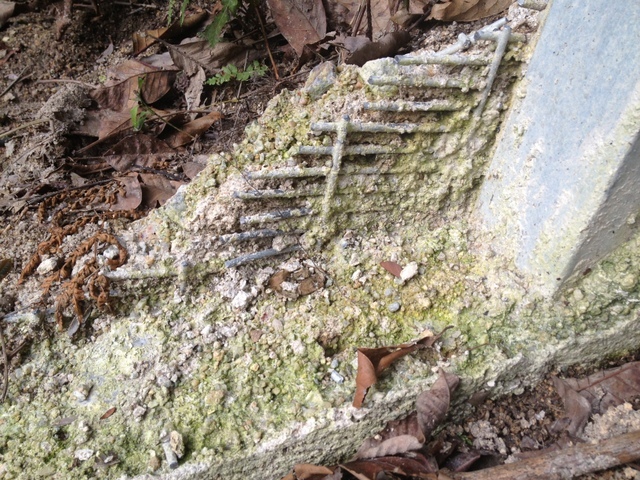 The fence has been embedded in the cement and will be very difficult to remove. 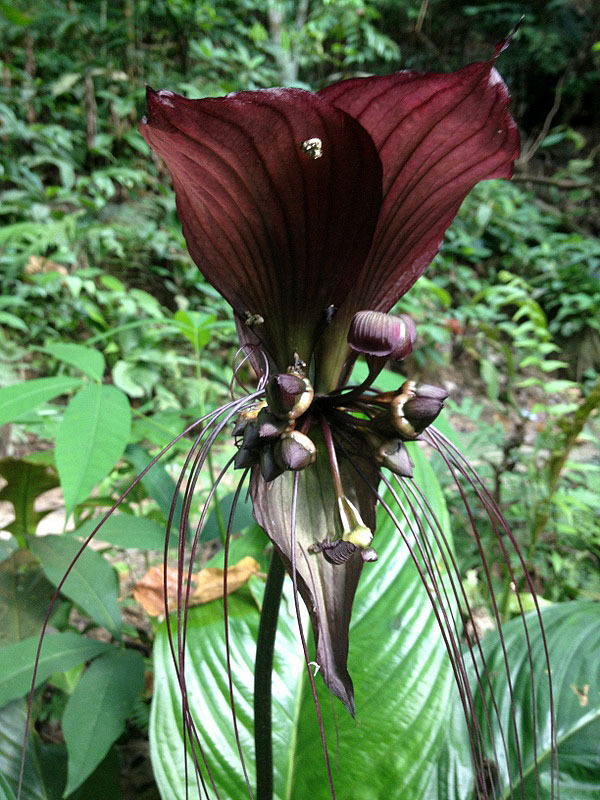 Fortunately there is still much beauty to be found in Bukit Kiara. 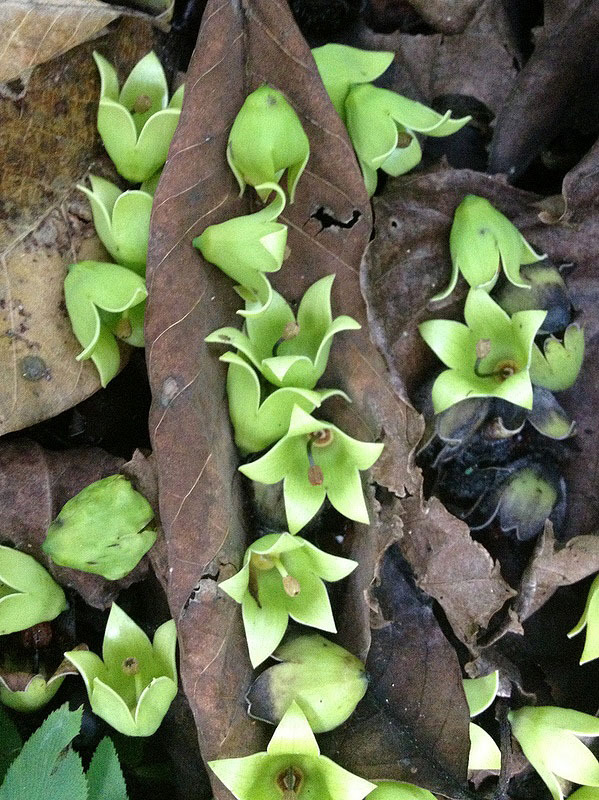 From left to right a Bat Lily, a tortoise and some unknown flowers(?) fallen down from a tree. This weekend the Chinese Year of the Snake will start. As usual I will send a digital New Year Card to family and friends, so I was looking in my photo archive for a suitable picture of a snake. Not so easy, because I don’t meet with snakes that often. 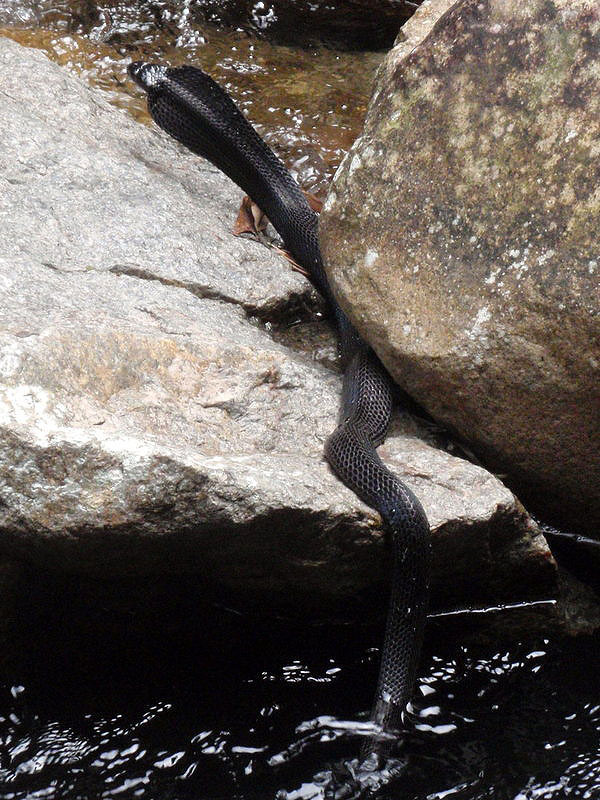 Here is a collection of my encounters with snakes during the last ten years. 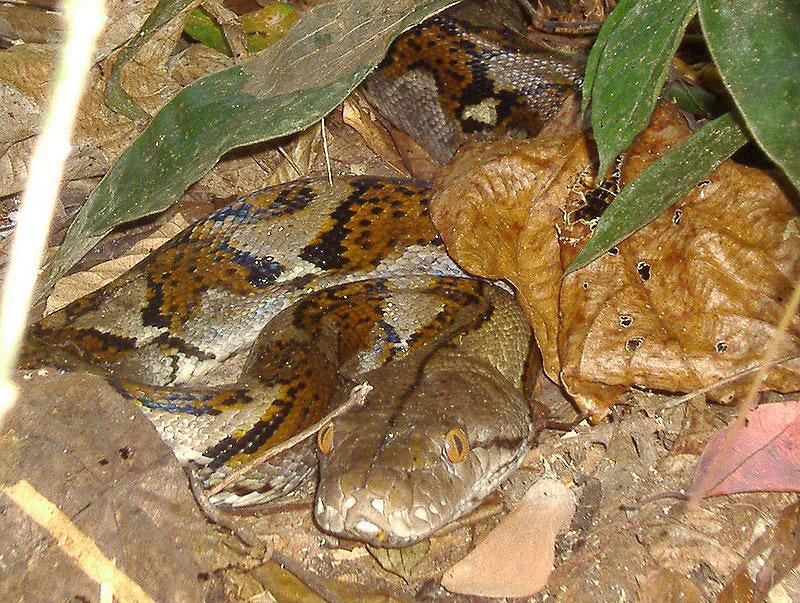 I had only one encounter with a python on a jungle trip. 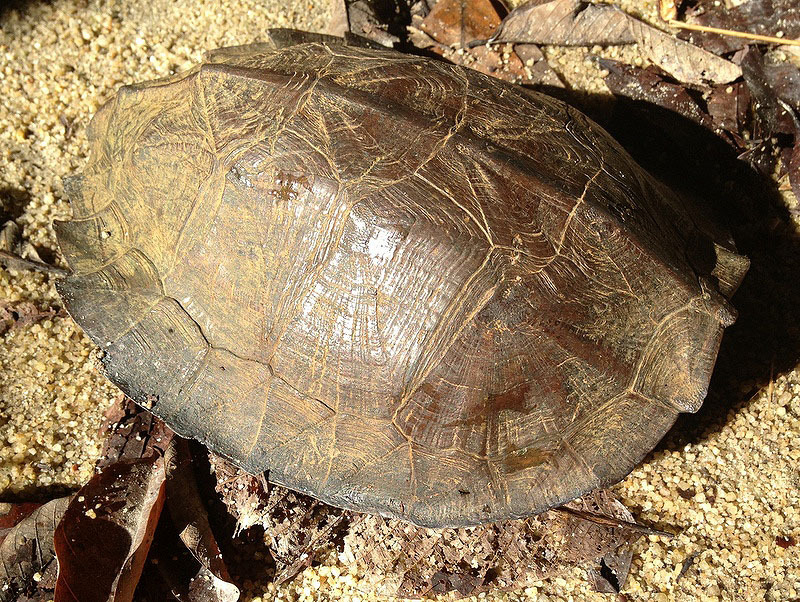 Actually I almost stepped on it, as it was resting just besides the trail. It didn’t move at all, first we thought it might be dead, but when I touched its head (ok, with a long stick, not my fingers, lol), it opened an eye. I think it must have eaten recently. 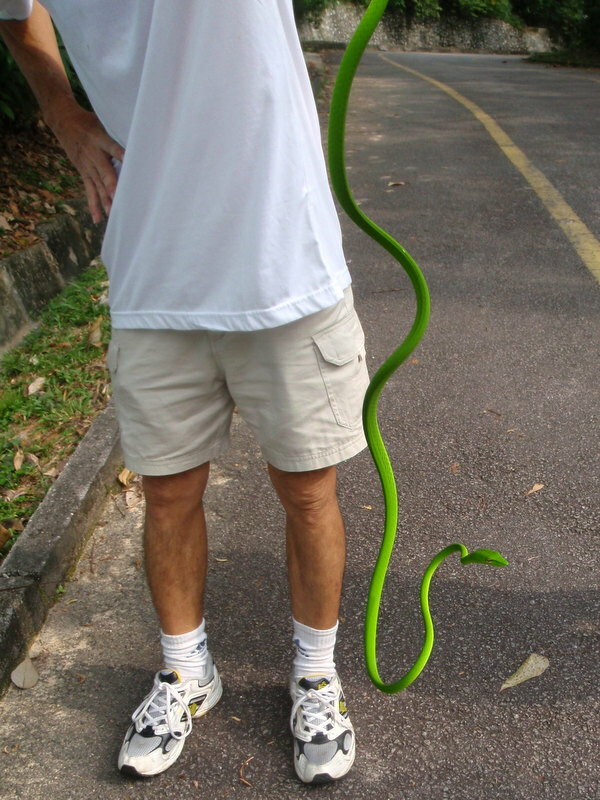 One of my first encounters with a snake in the wild occurred in Endau Rompin National Park. 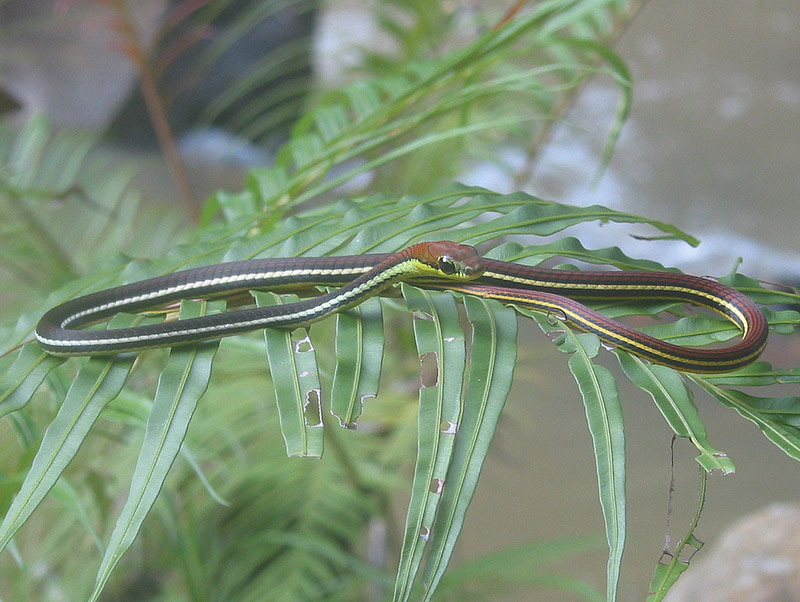 After a waterfall trip and a bath in the Selai river, I was relaxing near the river with a book, when I noticed that less than one meter away a beautiful snake was doing the same (without a book). Moving slowly I stood up and walked to my backpack to get my camera, hoping the snake would stay where it was. It did. 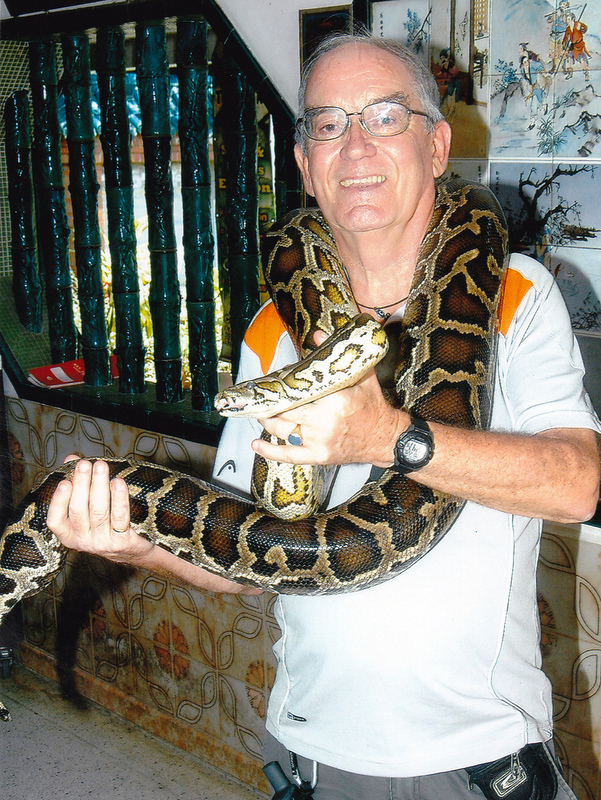 To be honest, I had one encounter with a snake which could have ended unpleasantly. It happened at Upper Chiling fall. I was carefully crossing the river, when I saw not far from me what I thought was a stick. 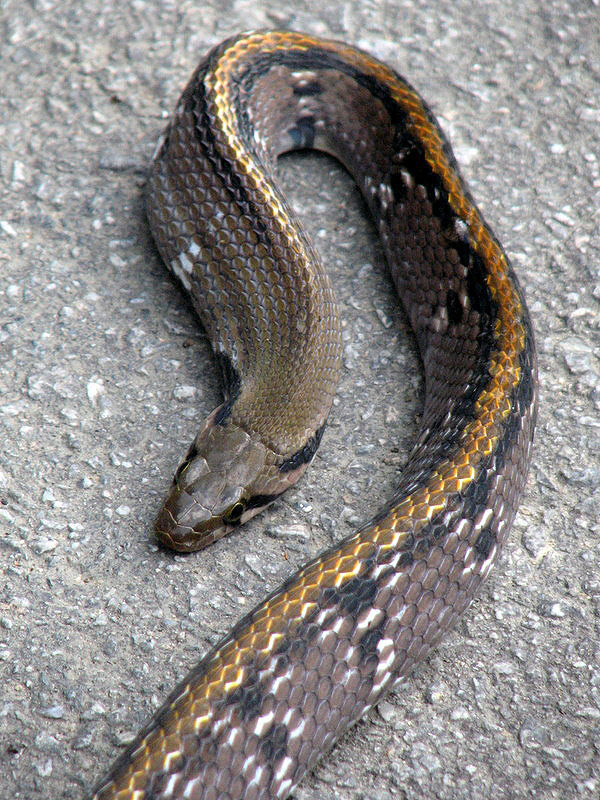 But the stick was waving and at the same time my friends shouted, look out, snake! Within a split second I was back on the bank of the river! It was a black spitting cobra and clearly not pleased with my presence. The main danger with this kind of cobra is that they can spit accurately in your eyes, causing blindness. 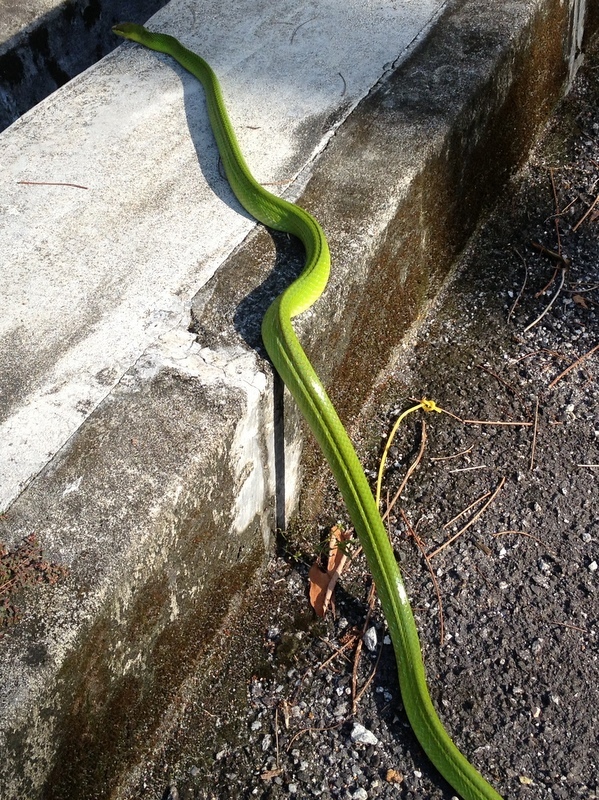 During my usual walk in Bukit Kiara we quite regularly notice green whip snakes resting on the ferns. 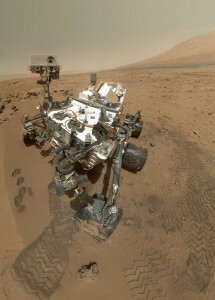 To be more precise, I don’t usually notice anything until my friend Robert spots one, he is very good at it. Beautiful snakes, only slightly poisonous, it seems. In the picture to the right Robert shows that you can take the snake by its tail. 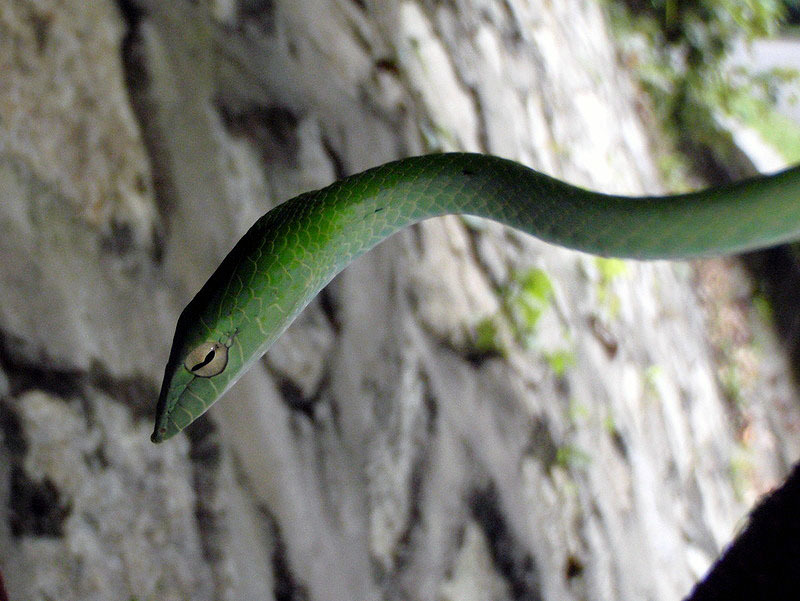 Here is a picture of another whip snake, also taken in Kiara, isn’t it beautiful? 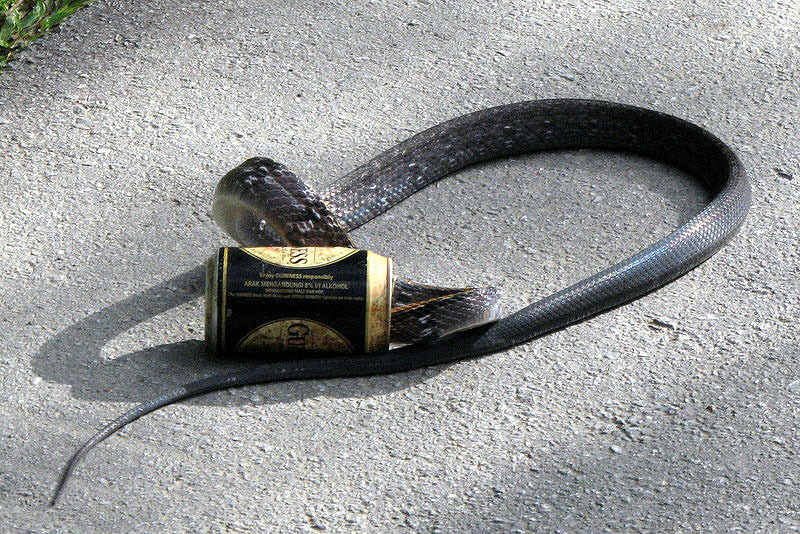 During a trip with the Kiara Bunch, a few years ago, we had a remarkable encounter with a snake which had managed to get its head inside an empty Guinness beer can! The poor creature could not get it out, so of course we (Robert, that is, haha) rescued the snake from an untimely death. I think this is a (harmless) rat snake. By the way, for those of you who believe in astrology (none, I hope!) the Snake zodiac is not a bad one. Although for me, a Monkey, it may become a turbulent year. Hm, as if the last year was not turbulent enough already! You may ask, did I find a suitable snake picture for my New Year wish? Yes, I did! 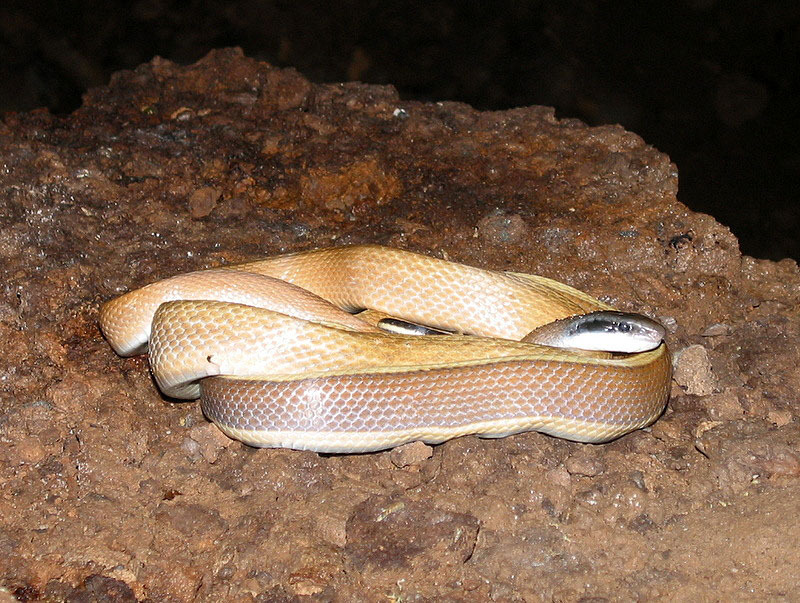 It’s a temple snake in the Penang snake temple. When you enter this temple, at first you may ask, why do they call it a snake temple? But when you look more carefully, you will find snakes all over the place. Here is our card. 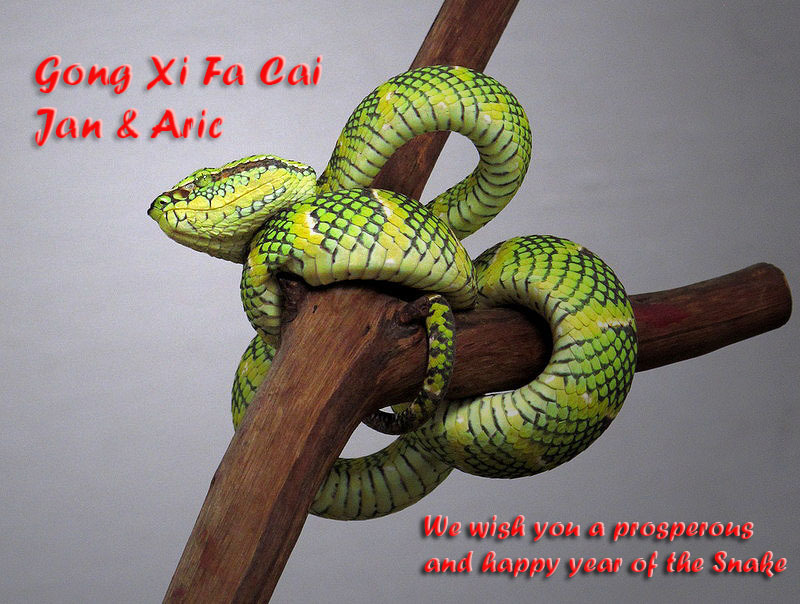 May the year of the Snake fulfill your wishes, and bring you happiness. 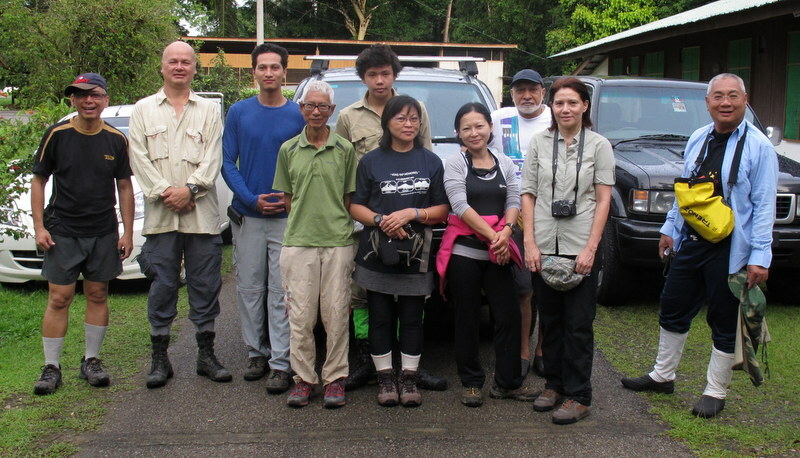 Last weekend I have joined a trip organised by MyCat to the Sungai Yu Wildlife Corridor near Merapoh. 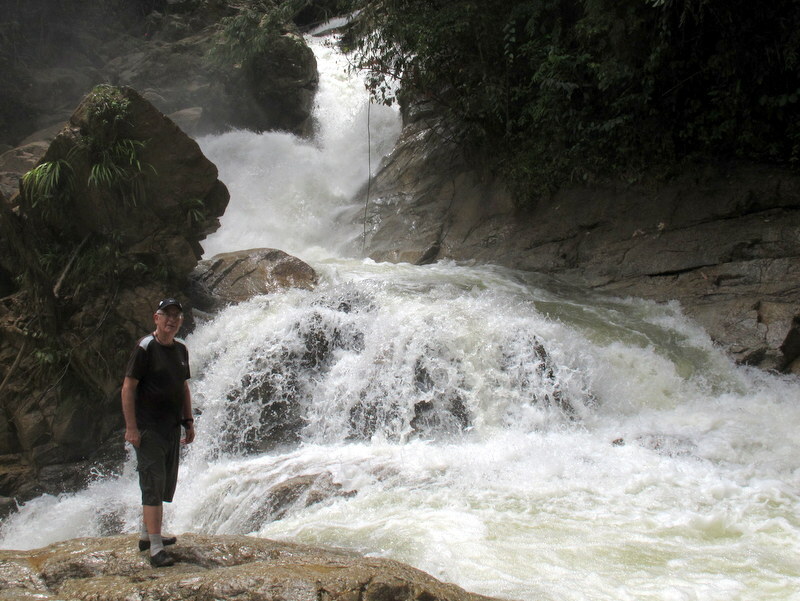 We did not see any wildlife, but visited a waterfall, a canyon and a cave, camped in the jungle and had big fun. Good for my self-confidence too, after my two recent mishaps. Here is our group before we started. Detailed report here. But today I read that no evidence for organic material has been found yet. 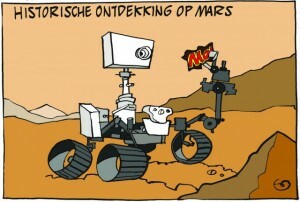 After the announcement of the historic discovery a funny cartoon was published in a Dutch newspaper. The Mars chocolate bar is a popular sweet in the Netherlands. Next week my Kiara kaki Henry will travel to the USA with his wife to visit his son there. 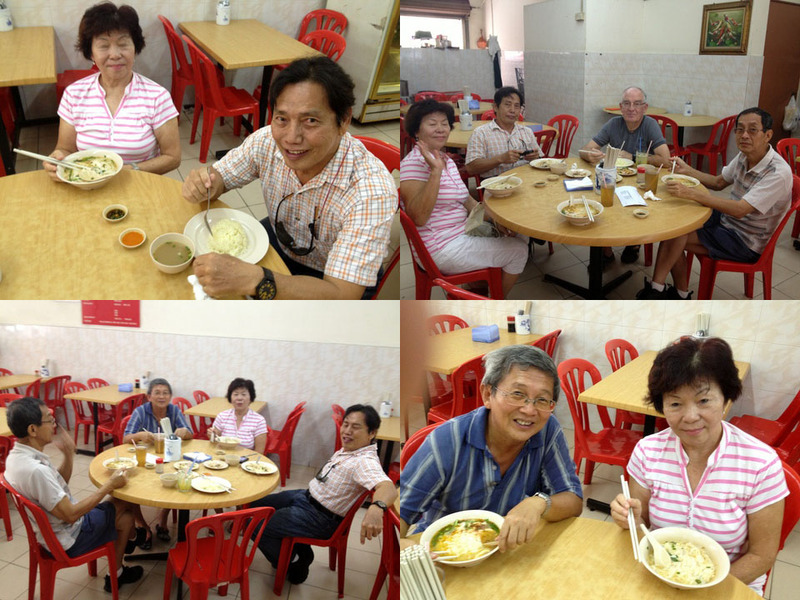 With a few Kiara friends we had a kind of farewell lunch at TK Chong near my condo.